"Johannesburg Holds Big party on arria of rairoad." 1897: Merry Christmas to the Rand Mining District. On December 22, 1897 the first engine arrived at the Johannesburg, Ca. Depot on the new rail bed of the Randsburg Railway. Although not officially opened until January of 1898 the railroad took exactly one year from the first mention of it in the Bakersfield Daily Californian on December 22, 1896 until its arrival in Johannesburg. It was first reported, in May of 1897, that the firm of Bright & Cranda of Randsburg would accomplish the contract for the grading of the right of way. 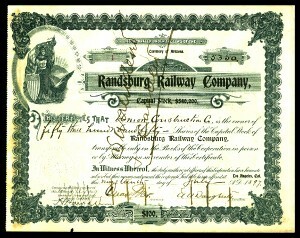 It was then reported, in June of 1897, that the three men that had formed the Randsburg Railway Company had also formed a new corporation called the Union Construction Company to build the railroad. James Campbell, a renown railroad builder who started with the “Big Four” on the Central Pacific and had built a number of railroads since, was to be in charge of construction. Then in September of 1897 it was reported that a Mr. Woodward who was the former Superintendent of the Louisville, New Albany, and Chicago Railroad was in Johannesburg to oversee the job for the owners. The construction of the Randsburg Railroad was actually accomplished by the firm of Ramish & Marsh of Bakersfield, Ca. Work actually started on the railroad on the 2nd of October 1897 and was originally slated for completion on the 25th of November of 1897. 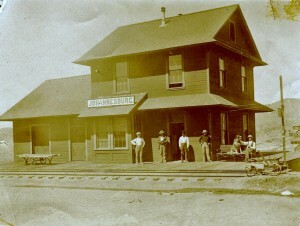 By the 15th of November of that year the railroad had reached a point five miles S of Johannesburg called St. Elmo siding, which had been laid out as a town site in April of 1897, but never really developed due to lack of water. 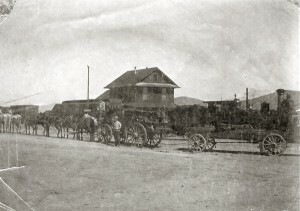 The Railroad was delayed here several weeks awaiting material, however passengers and freight were being shipped to that point. By the 2nd of December they had the grading and track laying to a point about 1 to 2 miles south of Johannesburg where they encountered a prospect hole belonging to two miners by the names of Webb and Wren. These two miners did not like the idea of a rail bed being built directly over the top of the entrance to their mine and refused to let the contractors proceed. The contractors, however, then came back during the night with their crew and proceeded to build the railroad over the miners shaft. When the miners found out that they had a railroad over their mineshaft they went with a crew to tear up the railroad but were driven off by gunmen hired by the railroad. It was feared for a while that further trouble would develop, but this did not materialize. 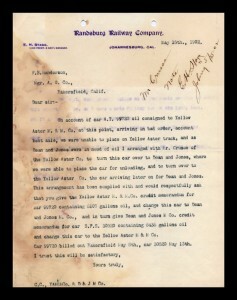 The Randsburg Railroad did not realize the outgoing freight (ore) business that they hoped they would receive. The Santa Fe Reduction Works, a forty stamp mill, which was being built by the owners of the railroad in Barstow, to process the ore from the Randsburg Mines, was not completed until June of 1898. For a while the Yellow Aster used this mill and in September of 1898 the Los Angeles Herald reported that : JOHANNESBURG- Sept. 16. — Work was commenced today adding another ramp to the elevated dump of the Randsburg-Santa Ye Reduction works. 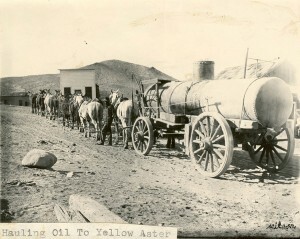 The two chutes already in place are used by the Yellow Aster people, and as the company expects to ship considerable ore from this section in the near future the third chute was made necessary.” In February of 1899 the largest mine in the Rand Mining District, the Yellow Aster, opened their own 30 stamp mill and in 1900 added another 100 stamp mill. The railroad lost their business. In addition the rates set by the Randsburg Railway in conjunction with the Santa Fe and the Southern Pacific did not turn out to be cheaper than people were paying for Stage and freight by wagon. Consequently they still had competition for both incoming and outgoing freight and passenger business. While the larger mines in the area built their own mills and did not ship ore out of the area a number of the smaller mines could not afford a mill and continued to ship their ore to Barstow for milling. This and the incoming freight business kept the railroad solvent and making a profit, if not the killing they had originally hoped for. 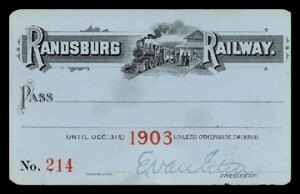 A Statement of Earnings, Operating Expenses and Taxes for the Randsburg Railway Company in May of 1902 showed that Income for the previous eleven months totaled $46, 570.77. Expenses for the same period totaled $21, 274.59 for a net profit after taxes of $25.296.18. This bettered the prior-year’s same eleven-month period by $4,925.75. In 1903 the owners sold the railroad to the Santa Fe at a reported price of $300,000 which was $120.000 more than it was reported to have cost. Subsequent strikes in Atolia (Tungsten) and Red Mountain/Osdick (Silver) kept the railroad operating through the 1920’s. The Santa Fe abandoned the Randsburg route on December 30, 1930 and removed the tracks a few years later. The Joburg Depot was dismantled in 1938, the upper floor being moved to one end of the block, the lower floor to the other. For a more comprehensive history of the Randsburg Railway we recommend the book “A Road to Riches: The Randsburg Railway Company and Mining District” by Phil Serpico. This entry was posted in Johannesburg, Johannesburg Transportation. Bookmark the permalink.